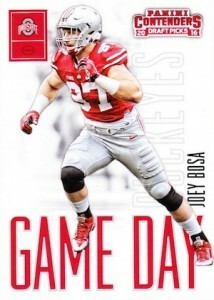 Continuing their college-centered Contenders release after the debut in 2015, 2016 Panini Contenders Draft Picks Football largely keeps the same format. Each hobby box includes five autographs ( down from six last year) and a ton of inserts. 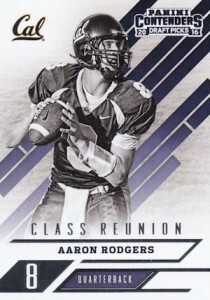 Season Tickets act as the base set with top NFL names shown in their college gear and a look that is similar to the primary design in the main 2015 Contenders set. Adding to that total are multiple parallels, including Cracked Ice (#/23) and Printing Plates (1/1). Just like Rookie Tickets dominate the main product, College Tickets are the big draw in 2016 Panini Contenders Draft Picks Football . Showcasing the biggest names from the 2016 NFL Draft with a sticker autograph, parallels include Bowl Ticket (#/99), Cracked Ice Ticket (#/23), Playoff Ticket (#/14), Championship Ticket (1/1), and Printing Plates (1/1). These also utilize the 2015 Contenders design. 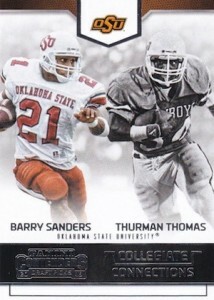 Honoring the greats of college football, Alumni Ink includes autograph cards for top names like Jerry Rice, Brett Favre, Joe Namath, Bo Jackson, Emmitt Smith, Dan Marino, Deion Sanders and Tim Tebow. Each falling several per pack, basic inserts are plentiful in 2016 Panini Contenders Draft Picks Football. The most common choices include Game Day Tickets (2 per pack), School Colors (1 per pack) and Old School Colors (1 per pack). Class Reunion, Collegiate Connections, Passing Grades and Rush Week offer even more to collect and each of these insert averages one in six packs. 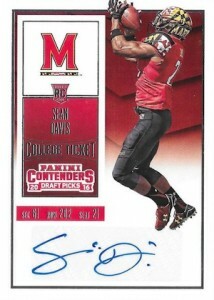 Signed parallels are also available for several of the inserts, including Collegiate Connections and Old School Colors. *All subjects not found in each parallel. View the spreadsheet for specific parallel lists. 39 cards. View a detailed guide and gallery to the variations. Short print info noted below. SP = 200 copies or less; SSP = 50 copies or less. *All subjects not found in each parallel. View the spreadsheet for specific parallels. 80 cards. All cards are Super Short Prints (SSP): 50 copies or less. 25 cards. All cards are Super Short Prints (SSP): 50 copies or less. 8 cards. All cards are Super Short Prints (SSP): 50 copies or less. 10 cards. All cards are Super Short Prints (SSP): 50 copies or less. 38 cards. All cards are Super Short Prints (SSP): 50 copies or less. Looking for a checklist. Have a date when you will have one? Always appreciate the help. You know what your getting with this from past years. 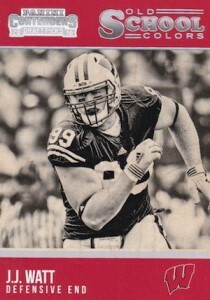 Nice looking cards, NFL stars back in college uniforms. Rookie auto’s. Bought a Hobby box first day it came out, pulled one the Luck/Sherman dual autos. So i’m happy with the product. Looks like the Carson Wentz Game Day card, #27, is a short print. I’ve opened 12 blaster boxes of this product so far, and only pulled 1. I hope the Wentz card #27 is a SP. I bought 2 blasters and got one of those. My auto’s were not super but cards looked nice and the checklist is CRAZY. U have a shot at pulling some Major cool signatures and representing their college teams! Love it, I’m gonna chase a bunch of cards. Love it. I just pulled a Jared Goff Auto Variation…Wasn’t sure if it was, uintil I looked at the other Goff auto’s on ebay…Mine was different…Then I checked the Variation Guide on here and sure enough, it is the variation version…Very cool product…Also got a cut ice auto of Steven Scheu…Not the best player in the set, but a nice addition to the Goff Variation auto! Bob C � Nice pull, Bob! They definitely were slow to surface online, so it took longer to identify the likely variations SPs. Bought 2 blaster boxes all 4 autos were above #200 ( not sure if this is common in blasters) but did get Jordan Lomax /99. Nice looking cards I plan on getting more of these. Another difficult to attain card…hard signed panini anything. 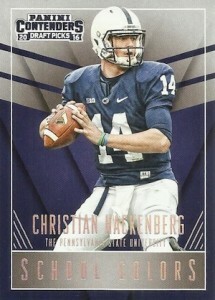 Panini yet again has came out with another product that we have become accustomed to seeing year after year. A very large checklist to obtain, sticker autos, and inserts that seem to have low value to a collector who collects all the time. I will say if your new to the game of collecting, or are looking for something inexpensive at your local Walmart “Big box” store then this would be a great choice for any collector. Bottom line compared to other products this was average. Three stars. Nice touch though on 5 autos in the hobby box. Panini made their reputation on this product years ago. This checklist means absolutely nothing! What does less than 200 or 50 mean? Is it 199 or 51? Is it 49 or 2? The info. given is stupid because all those print runs are already on the cards! It’s the ones that aren’t serial numbered that we want to know! In the past I’ve sold cards for nice money knowing their were only 30 or 70 or 120 or ? 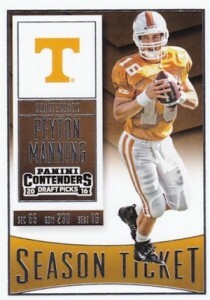 Unless Panini goes back to what made this product, i will not buy anymore! It’s sad because I’ve bought this product from the beginning! 3 boxes at 69.00 a pop, good value when a Wentz auto /99 comes out!! Really liked the product, tons of autos and price is decent…….Now. Pulled a Passing Grades of Dak and Wentz neither of which had their name one the bottom left of the card and I haven’t seen any others like them on the Bay, any info on that as a short print which it has to be? 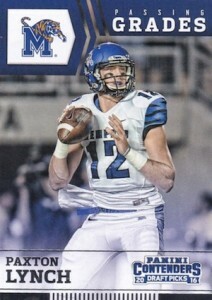 How many blue foil autograph cards, of a given player, were produced? Lets say Wentz. I can’t find the info anywhere!! If you take a look at the checklist above, you will see a tab specifically for the Red and Blue Foil parallels. Wentz is an SSP, so 50 copies or less.